The Model 70 features an easy-to-use, intuitive menu that makes advanced programming and calibration simple. Onscreen full text and phrase prompting does away with cryptic, mnemonic based instrument displays. This newest analyzer is available in single or dual sensor input versions . I n the case of the dual senso r version, the enclosure takes up half the space of most other transmitters. The transmitter has two 0/4–20 mA outputs that can be programmed to correspond to the measurement and temperature. Both two- and one-point calibration are available with the Model 70. Easy one-point recalibration while the instrument is online makes adjustment after grab sample analysis quick and simple. The Model 70 dual-input analyzer offers single or dual sensor input with an unrestricted choice of dual measurements thus reducing the cost per loop and saving panel space. Th is multi-parameter instrument offers a wide range of measurement choices. The modular design of the instrument allows signal input boards to be field replaced making configuration changes easy. Exclusive Quick Start screens appear the first time the Model 70 is powered. The instrument auto-recognizes each measurement board and the display prompts the user to configure each sensor in a few quick steps for immediate deployment. Menu screens for calibrating and programming are simple and intuitive. Plain language prompts and help screens guide the user through these procedures. The Model 70 accepts single or dual sensor input. Standard 0/4-20 mA current outputs can be programmed to correspond to any measurement or temperature. The instrument fits standard ½ DIN panel cutouts. The versatile enclosure design supports panel-mount, pipe-mount, and surface/wall-mount installations. Inputs are isolated from other signal sources and earth ground. This ensures clean signal inputs for single and dual input configuration. For dual input configurations, isolation allows any combination of measurements and signal inputs without cross-talk or signal interference. Most measurements require temperature compensation. The Model 70 will automatically recognize Pt100, Pt1000 or 22k NTC RTDs built into the sensor. Two levels of security access are available. Program one access code for routine calibration and hold of current outputs; program another access code for all menus and functions. The analyzer continuously monitors itself and the sensor(s) for problematic conditions. The display flashes Fault and/or Warning when these conditions occur. Information about each condition is quickly accessible by pressing the diagnostic button on the keypad. Help screens are displayed for most fault and warning conditions to guide the user in troubleshooting. 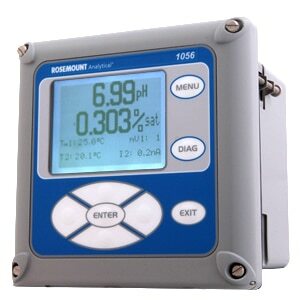 The high-contrast LCD provides live measurement readouts in large display digits and shows up to four additional process variables or diagnostic parameters concurrently. The display is back-lit and the format can be customized to meet user requirements. Two 4-20 mA or 0-20 mA current outputs are electrically isolated from other signal sources and earth ground. Outputs are fully scalable and can be programmed to linear or logarithmic modes. Output dampening can be enabled with time constants from 0 to 999 seconds. Analog 0/4-20 mA output, switching AC 85-265VAC power supply, 4 alarm relays. The standard analog communication protocol for over 20 years. The primary variable is transmitted via a 4-20 mA current loop from the field device to the control system. Only one variable can be transmitted per loop. No secondary data is available for the control system, and the field devices can only be calibrated and configured at the device itself in the fermentation or cell culture suite.